What is a Recurring Small Batch Contract Manufacturer? Most of the electronics manufacturers you'll see around these days are the giants – large batch powerhouses that can serve the largest needs and highest demands. But the market doesn't just consist of jobs with large batch requirements; and a traditional contract manufacturer often doesn't have the infrastructure designed to handle small batches. They may even be resistant to provide small batch services because the overhead is high and the profitability low. Small batch contract manufacturers fill the gap. 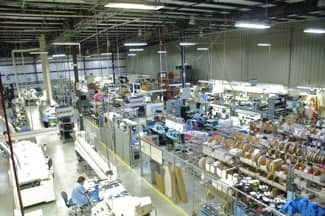 By developing infrastructure that supports rapid reconfiguration, hiring personnel who are enlivened by shifting job requirements, and employing a work model that swarms employees and resources to the most demanding contracts, a recurring small batch contract manufacturer has the agility to meet fast turnaround times at the highest quality. And because small batch manufacturers know that they might only have one chance to get it right, their documentation processes are exacting, meaning that should additional orders come in, they'll know exactly what to do. Manufacturers specialize in orders as low as a single assembly. As an example, we primarily handle orders from 1-500 pieces. Because most electronics buyers spend a good deal of their time on the hassle of getting larger companies to handle their small batch needs, recurring small batch manufacturers can take a lot of the strain out of production. Because small batch manufacturers complement rather than compete with large batch manufacturers, subcontracting can be done to lower overhead and ease the strain on their companies and processes. Each type of shop can make referrals to the other. Small batch manufacturers are experts at shifting requirements and unpredictable demands, and don't just streamline a single manufacturing process, but also the meta-process of moving from one manufacturing requirement to another. Employees at small batch companies work closely with their customers, familiarizing themselves with the customer's products and needs so that they can respond quickly to any new manufacturing orders, and begin to anticipate unexpected circumstances. In general, small batch manufacturers are as ill-equipped to handle large-volume orders as large batch shops are to handle the small ones, so recurring small batch contract manufacturers often partner with large batch companies to provide customer service across the spectrum of their customers’ needs. This partnership may be invisible to the end customer if one shop subcontracts to the other. Another choice is for the shops to work directly with the customer as co-providers. In either case, it pays to get to know a contract manufacturer specializing in small batch orders. Knowing their technical capabilities, their optimal batch size and changeover procedures, and – maybe most importantly – how they complement with your business, will help you get the support your business needs.